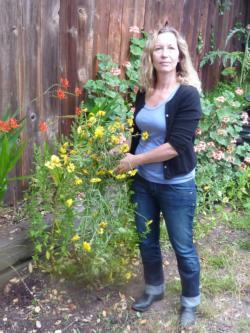 The Master Gardeners at Elkus Ranch designed a study to compare the yield and vigor of a variety of vegetables grown with and without mycorrhizal fungi plant inoculum. Products claim to increase size and health of plants have been made by a number of suppliers of inoculate, without providing much supportive data. The goal of this trial was to document the planting, comparative growth and yields of six vegetables planted in two beds, one bed inoculated and the other non inoculated, so that the results would help the home gardener make an educated choice on whether or not to use a mycorrhizal inoculum. The study was conducted in a Zone 17 coastal climate. Vegetables grown with endomycorrhizal fungi plant inoculum will be more vigorous and produce higher yields than vegetables grown without inoculum. Background: What is ‘endomycorrhizal fungi plant inoculum’? A mycorrhiza, from the Greek ‘mykos’ meaning fungus and ‘riz’ meaning roots refers to a symbiotic association between a fungus and the roots of a vascular plant. They form an important component of soil life and soil chemistry. In a mycorrhizal association, the fungus colonizes the host plant's roots, either intracellular as in endomycorrhizal fungi, or extracellular as in ectomycorrhizal fungi. This study is concerned with the former. Mycorrhizal fungi form a mutual relationship with the roots of most plant species. This association provides the fungus with relatively constant and direct access to carbohydrates, such as glucose and sucrose. The carbohydrates are transferred from their source (usually leaves) to root tissue and on to the plant's fungal partners. In return, the plant gains the benefits of the mycelium's higher absorptive capacity for water and mineral nutrients due to the comparatively large surface area of mycelium to root ratio. This improves the plant's mineral absorption capabilities. The mechanisms of increased absorption are both physical and chemical. Mycorrhizal mycelia are much smaller in diameter than the smallest root, and thus can explore a greater volume of soil, providing a larger surface area for absorption. Mycorrhizal fungi are especially beneficial for plants in nutrient-poor soils. Mycorrhizal plants are often more resistant to diseases, such as those caused by microbial soil-borne pathogens, and are also more resistant to the effects of drought. This is an important thing to consider in the rain challenged Bay Area. 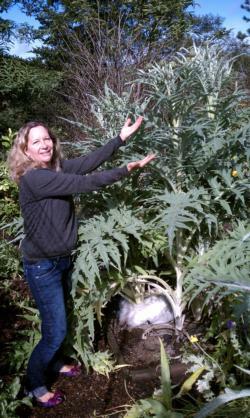 Seeds of the following plants were started in one inch cells in a green house on March 3, 2011: golden chard, strawberry spinach, double red orach spinach, epazote (Mexican culinary herb), edible Japanese chrysanthemum garland round leaved and cardoon (related to the artichoke). On March 23rd, the seedlings were transplanted into four inch containers. On April 5th the seedlings were planted, half of each variety, into two beds at Elkus Ranch Research Garden. The soil in both beds consisted of a combination of 50% Elkus compost and 50% Elkus dirt. Bed B was given a good watering at planting using H2O straight from the hose. Both beds received 10 minutes of drip irrigation every day for the first two weeks. On April 17th, irrigation was reduced to 10 minutes every other day due to cool, foggy spring weather. The vegetables that received inoculum grew slightly taller than those that did not receive inoculum (except for the strawberry spinach). We began harvesting and eating the plants mid June. A very informal ‘taste test’ was conducted on plants from the two beds. It consisted of asking volunteers to comment on what they noticed, if anything, between samples from Beds A and B. They were not told from which bed their samples came. Four of the five subjects thought that the samples of spinach, both strawberry and orach, were ‘sweeter’ from the beds receiving inoculum. No difference was noted for the other plants. 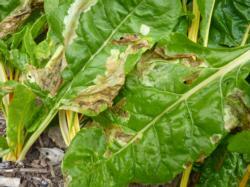 The golden chard grown in Bed B without inoculum, suffered severe leaf damage from leaf miners. These critters feed within the tissues of the leaves themselves, selectively eating only the layers that have the least amount of cellulose. 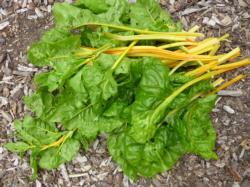 The chard receiving inoculum at planting had no leaf damage. 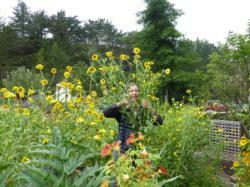 while those in the non inoculated beds only grew to 4 feet. 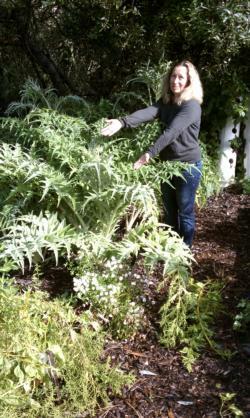 The Japanese chrysanthemums grew over 9 feet tall in the inoculated beds. The author peering through her produce. Those in the non inoculated beds grew under 4 feet. The vegetables in the bed that received mycorrhizal fungi inoculum grew larger (cardoon, epazote and chrysanthemum), were more disease resistant (chard) and, according to a very small sample size, sweeter tasting (strawberry and orach spinaches) than the vegetables grown without inoculum. I will continue to experiment with the use of mycorrhizal fungi plant inoculum in future plantings, and believe that it has great application in new beds and soils that may be nutrient poor. I would caution the home gardener that if they are interested in using mycorrhizal fungi, to purchase inoculum from a reputable source and do your homework first. Scientific analysis has shown that many of the ‘over the counter’ products that claim to contain live mycelium, do not in fact live up to that promise.